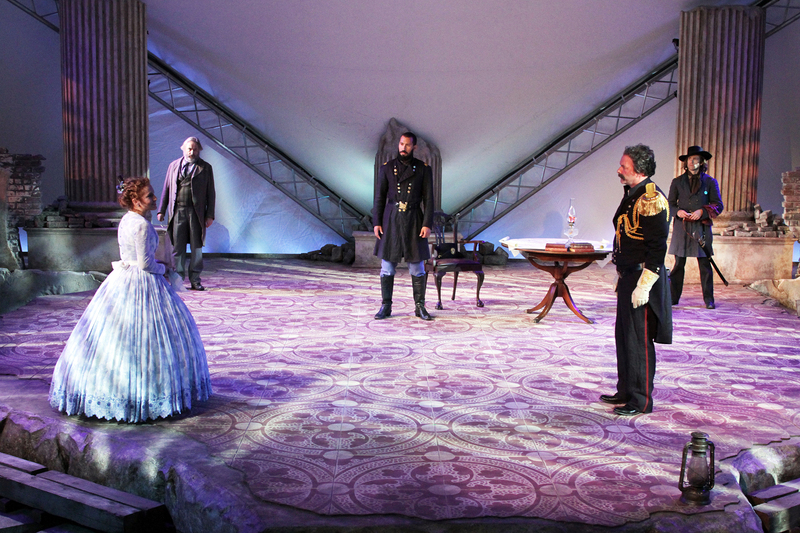 Othello, a civil war general for the Union Army, consults with his trusted advisor, Iago. As they sit in silence poring over maps and strategies, Iago masterfully manipulates Othello into thinking that his new wife, Desdemona, may be unfaithful. Once Iago has planted the seed of doubt, this play unfolds with such elegance that it’s impossible not to get drawn into the intrigue. Bob Frazer has set this production in Charleston during the American Civil War, and although this sounds like a very interesting setting that might yield chilling results, it didn’t coalesce in that magical way that a production does when everything just works together. The set was far too sparse with little else except large columns and a few wagon wheels strewn about. The colonial furniture helps, but the stage could have been dressed more thoroughly to convey the setting more clearly. The costumes and music did more to help place us in the Civil War era, although the songs felt a bit disengaged from the plot itself. This cast put on a decent performance, but I was not in awe except for a couple of scenes between Othello (Luc Roderique) and Iago (Kayvon Kelly) that reminded me of the brilliance of the writing and plot of this tangled tale of manipulation and misplaced trust. Othello trusts his loyal ensign too much, and claims that he loves Desdemona too well when he easily falls into Iago’s trap of lies. Desdemona (Kayla Deorksen), for her part, comes across as someone who would not bend to Othello’s will as she does. The themes of jealousy, reputation, deception, trust, racism, and loyalty all resonate very well for us today, and this production did highlight the racial aspects of the play better than other versions, but I didn’t feel the weight of this as much as would have liked. In fact, there were a few serious moments that elicited laughs when I didn’t think that was the intent. There were humorous moments here, but the serious ones needed a bit more intensity to hit home. In the end this is still a highly enjoyable production that will draw you into the story and pull you along through all the twists and turns it has to offer, but you probably won’t leave the Douglas Campbell Tent awestruck.